Helix, the DTC genomics company Illumina spun out in 2015, is open and ready for business. They have used their initial $100M investment to establish a marketplace for the analysis of consumer genomes – an “app store” for genomics, along the lines of Apple’s App Store or Google Play. 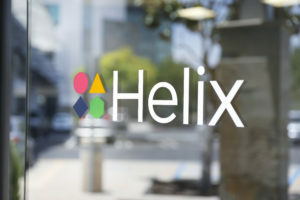 Helix does the heavy lifting by collecting the consumer samples (via a saliva collection kit) and sequencing the genome. Specifically, they perform what they call an “Exome+” sequencing, which includes the ~2% of the protein-coding portion of the genome along with additional regions of the genome that Helix has determined to contain relevant information. Their business model works like this. You pay $80 for the sample collection and Exome+ sequencing (which would normally cost more like $500 on the open market). But you don’t get to see any data and Helix doesn’t return any results. Instead, you get that when you buy a follow on app (or “DNA-powered product”) from one of the companies participating in the app store. The apps fall into one of several groups: ancestry, entertainment, family (pre-natal and infant health), fitness, health, and nutrition. The cost of these apps, which is on top of the initial $80, currently ranges from as little as $24.99 for SlumberType (for telling you how your DNA impacts your sleep patterns) to as much as $249.99 for Food Sensitivity+ (for telling you what impact your genome may have on you react with various foods). The good news is that Helix holds on to your sequence in their database so that if you buy a second (or third) app, you don’t have to resubmit your DNA sample or pay another $80 sequencing fee. And from the app providers’ standpoint, they don’t have to worry about investing in the expensive sequencing platforms necessary to generate the data – they just focus on analyzing the data and reporting it back in a consumer-friendly form. It sounds like a winning formula, but the Helix genome app store contains an odd mix of products. Some are based on fairly well established models, like those in the Ancestry category. 23andMe, while not currently part of the Helix marketplace, has been doing something similar for about a decade. The Entertainment category is filled with some whimsical (and some might say “pointless”) apps. Personalized Scarf, for example, let’s you buy a $150 scarf ($230 if you include the sequencing) with a unique pattern based on your DNA. My final thought is the idea that Helix is built on the premise of “sequence once, test many times”. That implies that future sequencing technologies, especially those with long reads, won’t lead to significant changes in the interpretation of the data. I’m oddly proud of the fact that of 23andMe’s over one million customers, I was one of the first 200 people to get tested on the platform (Illumina employees got a special early access deal since they were using our technology). But being that early means that a number of interesting variants, like APOE4, aren’t included in my results – they were added much later. Since Helix is using the much more comprehensive exome sequencing method, they’ll be more future proof, but something better will surely come along. Then again, at only $80 it isn’t that much of a gamble. Just don’t take the results too seriously.